If you have a mold problem in your home, you probably smelled it before you saw it. Mold and mildew have an earthy, dirty smell, that isn’t horrible if you want to smell like you rolled around in a mud puddle. However, most people don’t want to have their home smell like that, or themselves for that matter. Luckily there are a lot of options to get rid of these smells even after Clean Masters have dealt with your mold cleanup in North Charleston. Here are some tips for keeping your home smelling fresh. The best way to keep your home from smelling like mold is to prevent the mold from ever returning to your home after your mold cleanup has been taken care of. If you had a professional clean up the mold in a particular room, you now know that that room is susceptible to mold growth and you should be extra careful to keep moisture out of there. You can invest in a dehumidifier and you can keep windows open when weather permits to keep the air ventilated. 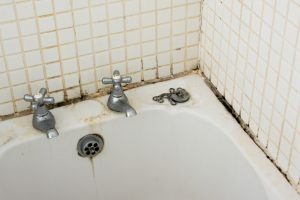 Many times mold will be found in bathrooms or kitchens where there is a a source of water nearby. So, it is likely that you will have some residual smell in your towels after the mold cleanup has happened. Towels and clothing can hold on to mold and mildew smells even after washing them several times, but there is still hope to get the odor out, so don’t throw everything away just yet. The most effective deodorizer for washing mildew out is some good old vinegar and baking soda. Wash your loads with as hot of water as your fabric will permit without having colors bleed and include a about a half a cup of vinegar and half a cup of baking soda. You can even do two separate loads with the first load only with baking soda and the second load only with vinegar. Then line dry your towels and clothes in the sun if possible. The sun will will help to bleach out your whites and it will also ventilate your towels better than a dryer. You can even fluff your clothes and towels in the dryer with a dryer sheet after they are fully dried in the sun to make them smell even more fresh. It is likely that your mold cleanup crew had to clean mold off of your walls in the particular room that was affected by mold, however, other rooms can trap the mildew and mold smell into the paint of the walls even though they have no mold on them. Paint is porous and it can trap odors, which is why cigarette smoke can be hard to get out. You should try to clean your walls first, but you might need to paint your walls if that doesn’t work. You can always contact your mold cleanup professionals to replace carpets or repaint walls if the smells linger. If you are living in a home that has always had mold and mildew odors, you don’t have to be living this way. There are ways to get these odors out but they do take a lot of elbow grease. Contact your mold cleanup professionals at Clean Masters today to see what they can do for you to get rid of unsavory odors.